- Publisher The $lt;I>Life Application Bible Commentary: Revelation$lt;/I> provides personal help, teaching notes, and sermon ideas that will address needs, answer questions, and provide help for daily living. This Bible commentary provides explanation, background, and application for every verse in the book of Revelation. 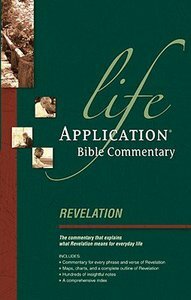 About "Revelation (Life Application Bible Commentary Series)"
The $lt;I>Life Application Bible Commentary: Revelation$lt;/I> provides personal help, teaching notes, and sermon ideas that will address needs, answer questions, and provide help for daily living. This Bible commentary provides explanation, background, and application for every verse in the book of Revelation. Bruce B. Barton is the general editor of the NIV Life Application Study Bible, and founder, owner and CEO of the Livingstone Corporation, a company that has produced 11 Gold Medallion winning books/Bibles. Dave Veerman worked for 26 years with Youth for Christ. He has authored more than 60 books including Youth Evangelism; Dave's Complete Guide to Junior High Ministry; Small Group Ministry with Youth; Tough Parents for Tough Times; and Letting Them Go.